When John Untener, director of information technology for Clayton L. Scroggins Associates Inc., a Cincinnati medical practice consultancy, approached Matt Scherocman in the fall of 2007 for advice on upgrading his company's finance and accounting system, Scherocman faced what seemed like a couple of bad choices. Scherocman, vice president of consulting services for PCMS IT Advisor Group, could try to convince Untener to give his company the contract despite the inconvenient fact that PCMS, which was already managing Scroggins' infrastructure, had no expertise in business-processing applications. Or he could just tell Untener, "I can't help you with this one. Good luck." However, Scherocman had an ace up his sleeve: a unique partnership with InterDyn-Socius. Like PCMS, InterDyn-Socius is a Gold Certified Partner based in Cincinnati; unlike PCMS, it happened to have the exact expertise Untener needed. Over the past few years, the two companies had developed a strong business relationship, teaming up to provide customers with Microsoft solutions in such a way as to draw on each partner's expertise while making clients feel as if they were working with a single company. Scherocman immediately recommended InterDyn-Socius for the job. Hersch Patel (left) of InterDyn-Socius and Matt Scherocman (right) of PCMS IT Advisor Group share more than 30 customers, including one engagement that earned them an award from Microsoft. "Microsoft desperately needs P2P collaboration because they have such a wide set of solutions. Very few companies are really big enough to handle what Microsoft has to offer end-to-end." Matt Scherocman, Vice President, Consulting Services, PCMS IT Advisor Group. Because Untener already trusted PCMS-which, in turn, trusted InterDyn-Socius-Scherocman's recommendation was all the vetting Untener needed. "When we came in, we were all excited about doing a sales presentation, and the conversation didn't even go down that path," recalls Hersch Patel, InterDyn-Socius's director of consulting services. "It was basically, 'Matt and PCMS recommended you, so you're in.'" Ultimately, Scroggins engaged InterDyn-Socius to upgrade its business-processing platform from an earlier Great Plains version to the latest iteration of Microsoft Dynamics GP. PCMS got additional work out of the deal as well: Clayton Scroggins hired the matchmaking company to install Windows Server and SQL Server to help the new application run more efficiently. The benefits of partnerships like the one between PCMS and InterDyn-Socius -- whose teamwork in the Clayton Scroggins project and similar efforts earned the pair a Microsoft Partnering to Succeed Award -- sound almost too obvious to merit discussion. Not only do such relationships result in new business opportunities, they make the partners look like they walk on water. That's also a major reason why Microsoft, which typically enjoys a significant sale for every successful engagement, has promoted and publicized such partner-to-partner (P2P) activity so enthusiastically, says Mark Kornegay, general manager for partner organization in Microsoft's 18-state Central region. In addition, Scherocman observes, "Microsoft desperately needs [P2P collaboration] because they have such a wide set of solutions. Very few companies are really big enough to handle what Microsoft has to offer end-to-end." However, genuine P2P relationships are more easily envisioned than executed, making them less common than you might think. A collaboration as fruitful as the one between PCMS and InterDyn-Socius requires levels of communication, trust and cultural compatibility that take time and energy to build. But as the Cincinnati case demonstrates, the effort can pay off handsomely for both parties -- and benefit customers as well. Because customers often have needs that stretch a single partner's area of expertise, partnerships such as the one between Cincinnati-based Gold Certified Partners PCMS IT Advisor Group and InterDyn-Socius make Redmond a happy place, says Mark Kornegay, a Microsoft regional general manager for partner organization. "It all boils down to customer satisfaction," he says. "That's the key driver." Accordingly, Microsoft is doing all it can to foster the collaborations that it considers such a critical part of its growth. For example, the company has enthusiastically supported the growth of local International Association of Microsoft Certified Partners (IAMCP) chapters throughout the world. Kornegay says IAMCP chapter meetings are an excellent place for Microsoft partners to network and perhaps identify potentially compatible candidates for a partner alliance. Additionally, Microsoft hosts an online tool called Microsoft MatchMaker, which facilitates the passing of various types of partnership leads between IAMCP members. Despite those efforts, however, Kornegay says Microsoft still sees too few partnerships like the one between PCMS and InterDyn-Socius. As a result, Microsoft is actively showcasing partners who do it right. "Where there's a great engagement, and a satisfied customer wants to do a white paper on it, we'll showcase that not only for the value of the white paper and the technologies deployed, but to demonstrate to the partnership community how well partnership can work for them," Kornegay says. The special relationship between PCMS and InterDyn-Socius dates back to 2004, when Microsoft sought to establish a Cincinnati chapter of the International Association of Microsoft Certified Partners (IAMCP), the nonprofit organization that focuses on facilitating business opportunities among Microsoft partners. 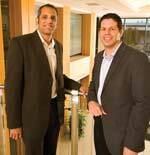 Microsoft asked both Scherocman and Patel to serve on the new chapter's board. Personally, the two hit it off right away. Professionally, they quickly realized that their companies had much in common. Both were midsize organizations that worked mostly with midmarket companies. They had developed similar corporate cultures. And, conveniently, they also had a number of mutual clients. In the earliest stages, before any official partnership, the organizations simply remained on each other's radar screens for any special needs that either company's clients might have. For example, InterDyn-Socius might explain to a client that it couldn't install new accounting software without a new server platform, and PCMS could help with that. As referrals grew, the two companies started agreeing to exchange finders' fees. If, for example, PCMS successfully recommended InterDyn-Socius into an account, InterDyn-Socius would pay PCMS a 5 percent fee, recognizing the fact that the latter company had just landed a new account without using any of its own marketing resources. Meanwhile, the two organizations started cross-training each other's staffs on what they each did well, so that either partner could speak knowledgeably to any customer about the other's solutions. Ultimately, the two companies began collaborating at customer sites, which, according to Scherocman, provided additional customer value. "We could be experts at what we did, rather than trying to go beyond our expertise," he says. And, he adds, customers were assured that if they happened to have a problem or a question for InterDyn-Socius, PCMS could help resolve the issue or obtain an answer. Without such a relationship, says Scherocman, "You'd have a situation where, if the software wasn't running right, the software guys would say, 'Hey, it must be the network.' And the networking guys would say, 'No, it's definitely the software.'" Instead, says Scherocman, the partner companies could examine the situation together, take joint responsibility and fix problems without the customer having to serve as an intermediary. Today, PCMS and InterDyn-Socius share more than 30 clients and have worked hand-in-hand on more than a dozen engagements. Meanwhile, Patel points out, they've set ground rules to prevent them from fighting over opportunities in areas where their skills overlap -- for instance, in business intelligence. "Basically, if they've referred us into an account, [any areas of overlap] are theirs and vice-versa," he explains. Teaming up has clearly proven beneficial for the two Microsoft partners. But the benefits for their customers may be even more significant. For example, their collaborative effort helped Clayton L. Scroggins undergo a smooth, stress-free implementation. Given the project's complexity-among other things, it involved updating more than 400 databases-Untener had enough on his mind without having to worry about turf disputes or communication breakdowns between providers. "If I had worked with vendors where no such partnership existed, a lot would have fallen back on me" in terms of handling any conflicts that might arise, Untener says. "With this kind of collaboration, [the partners] made sure no piece of the project was dropped or forgotten. It was not a situation where one would be saying, 'I was responsible for these three steps. What happened to the fourth step?'" Most importantly, Untener's company can better serve its own clients, who experienced no disruptions in the process. "I'd do this again in a heartbeat," he says. This sort of partnership also enables a customer to better flag and address critical needs that otherwise may have gone unidentified. For example, in 2006, PCMS was working on general IT issues for G & J Pepsi-Cola Bottlers Inc., a $244 million beverage distributorship in Cincinnati. In a conversation with Chris Witzgall, G & J's vice president of information systems, Scherocman learned that the company -- which was using Microsoft Dynamics GP -- wasn't getting as much functionality out of its business applications as it wanted. At the time, a small, local, value-added reseller was supporting G & J's applications, and Scherocman, perhaps recognizing the reseller had software knowledge but no particular business-process-management expertise, suggested that G & J speak with Patel. G & J subsequently hired InterDyn-Socius -- which has extensive business-application as well as business-process expertise -- to help it better leverage its applications. Patel's initial impression was that the company just wanted to get more out of Dynamics GP, but when he met again with Witzgall and one of the company's owners to help select new human resources and payroll software, he realized their problems went beyond software functionality and into their actual architecture. Patel discovered that G & J was using Dynamics GP to run its financial systems and payroll at headquarters, while five bottling centers were using an IBM AS/400 based application for the same functions, in addition to Abra for HR management. "Two parts of the business were on a separate platform," says Patel. "We understood the problem and helped draw up a roadmap to fix it." InterDyn-Socius recommended that the company implement Microsoft Dynamics GP Payroll and HR for the whole enterprise. G & J took the advice and has hired InterDyn-Socius to handle the project. As this issue went to press, implementation was running on schedule, with the new system scheduled to go live in January. Patel expects that G & J will ultimately gain more powerful, real-time reporting of data, as well as realize lower cost of ownership now that it no longer has to maintain multiple platforms. Again, Patel adds, that's an outcome that might never have happened without the partnership between PCMS and InterDyn-Socius. "Who knows if they would have ever found us or made the change?" Patel says of G & J. "PCMS helped them open the door to seeing the possibility of finding a better partner for them-one with experience around business processes and a history with Dynamics GP." Once again, PCMS's referral of its partner led to more opportunities for PCMS itself. After InterDyn-Socius began its work, Patel learned that G & J needed some assistance with its Microsoft SharePoint software, an overlapping area of expertise between PCMS and InterDyn-Socius. In line with their partnership's ground rules, InterDyn-Socius introduced that opportunity back to PCMS, which was then enlisted to do the work. Compatibility. In Scherocman's view, the best alliances involve true peers able to work together on equal footing. A company growing at a rate of 40 percent a year simply won't be a good match with one that's struggling just to keep its existing customers. "We both have aggressive growth strategies," Scherocman says of PCMS and InterDyn-Socius. Communication. Partners must be almost obsessive about communicating openly, clearly and constantly -- and not just via e-mail. "It's better to communicate face to face, but for sensitive issues, it's critical to at least speak by phone," says Scherocman, who talks to Patel at least once daily. Staying in touch helps prevent either partner from acting on inaccurate assumptions and helps both respond quickly to customer needs. Company-wide involvement. What's the biggest mistake that new partners will likely make? Maintaining their relationship solely at the management level. "This is where I've seen partnerships fall apart," Scherocman says. "You go in and tell a customer, 'We've got this great partnership with XYZ company.' Then a tech guy comes in, and the customer asks how the XYZ partnership is going, and he says, 'I don't know what you're talking about.'" Customer focus. PCMS and InterDyn-Socius go well beyond just respecting their ground rules around overlapping opportunities. Whenever either company learns about a customer need that seems more appropriate for the other partner, they let the client know, rather than trying to hoard the work for themselves. The underlying philosophy: When either partner does what's best for their mutual customers, they're both likely to benefit. Pinpoint P2P prospects. Identify the top Microsoft partners in your area and determine which ones are successfully teaming up with others. Network by joining a local chapter of the International Association of Microsoft Certified Partners (IAMCP). Ask clients and prospects which partners they know and recommend. Pick partners carefully. Potential partners should target the same client segments that you do and their solutions should complement yours. Your partner's leaders should have strong communication skills and, of course, demonstrate willingness to partner. Connect your teams. Clients are wary of so-called "partnerships" that only exist at the executive or sales levels. They want to know that the functional teams will work well together, too. Help client-facing teams get acquainted so that they'll develop -- and display -- confidence in each other. The two Cincinnati partners scheduled "lunch-and-learn" dates to help unite their marketing, technical and other employees. Understand strengths and priorities. Take time to teach each other about your areas of expertise, your most profitable deals and the situations that typically cause you to walk away. Be honest. Let your clients know that you're working closely with a partner. Assure them that you won't share contact information or sensitive data without their permission. Start simple. A straightforward non-disclosure agreement can be a great quick-start to a P2P relationship. Later, if the partnership looks like a long-term one, you can take the time to craft a referral-fee agreement. Build awareness. Make sure local partner-account managers and other Microsoft representatives know about your partnerships' mission, projects and successes. That approach is especially noteworthy, says Microsoft's Kornegay. He points out that both partners operate in the Ohio-Michigan market, a region harder hit by economic woes than just about anywhere else in the nation. "When times are tough, people tend to hunker down and focus solely on their own opportunities-not broader ones," he says. "But the fact that these two partners have taken a more holistic approach to servicing their customers, even in a challenging economic climate, speaks volumes."